MIAMI -- LeBron James and Dwyane Wade know they share a relationship many don't understand. It's a bond that will be dissected extensively as part of the buildup to Thursday's Christmas showdown, when James returns with the Cleveland Cavaliers for his first game in Miami since his stunning and abrupt free-agency departure from the Heat. Wade has already called for Miami fans to welcome James back with gratitude for his role in leading the Heat to two of the franchise's three championships and four straight trips to the NBA Finals. But many are still grieving and confused. Some wonder how Wade could remain unapologetically loyal to a friend who ultimately cost him $11 million in a botched contractual transaction over the summer. Others find it mind-boggling how James could lean on the same "brother" for support he was simultaneously abandoning after so much success. To completely comprehend just how their bond extends well beyond basketball would have required a seat alongside them on that five-hour private plane ride James and Wade took together in July. It was a charter that carried them back to Miami from Las Vegas at the height of the NBA's free-agency frenzy. As James privately finalized plans to announce his return to Cleveland, he struggled to find the right words to officially inform Wade of the decision. At a time when Heat president Pat Riley was desperately trying to persuade James to stay through email and text messages that largely went unanswered, Wade boarded the previously arranged flight with James and made one thing clear. Wade wasn't there as a teammate to recruit James back to Miami. He was only around to support him as a friend. It was at that point, out of respect for their longstanding relationship beyond basketball, that Wade never strongly persuaded James to stay with Miami as the four-time MVP felt compelled to go home. "I'm not that guy," Wade said of refusing to recruit James. "I knew whenever it comes to somebody having to do what's best for them, I'm always going to take myself out of it and give them the best advice I feel I can give. I'm not going to be biased and give them what I think is going to be best for me. I tried to be selfless. I took being his teammate out of it, and I was just his friend." As Wade and James look forward to Thursday's reunion, both players shed some new light on how they dealt with one of the most difficult periods of their careers and how setting aside their roles as teammates allowed them to further strengthen their bond as friends. Informed of Wade's comments, James told ESPN.com that few people will ever understand what brought them together in Miami four years ago and what will keep them united long after they retire. "Our relationship is so strong, man, that when I decided to make my decision to come back here, [Wade] was one of my biggest supporters," James said. "Obviously, he wanted me to stay, and he was a big reason why I was teetering, going back and forth, because it's bigger than basketball with me and him. It's like a friendship that I can't really explain. It's like a brother that I never had." The two communicate frequently through phone calls and text messages and are as close as they have ever been in a friendship that dates to their time together before they became lottery picks in the 2003 draft. As recently as last week, they have encouraged -- and chided -- each other about the difficulties their respective teams have had adjusting to major changes this season. Wade joked Wednesday that he couldn't wait to rip James for the Cavaliers' lopsided home loss to Atlanta. But Wade caught himself when he realized James would have just as much to say about the Heat losing that same night at home by double figures to Utah. "I think we talk as much as you can ever talk to one of your best friends, whether it's about basketball or it's about [James' sons] Bronny and Bryce and [Wade's sons] Zaire and Zion and so on," Wade said. "It's what we do and what we've always done -- even before we became teammates, back when it was articles saying, 'How can these guys be so close and still compete against each other?'" Riley capitalized on that closeness when he convinced James, Wade and Chris Bosh that he could bring the three together during 2010 free agency to form a modern NBA dynasty. The Heat would become the first NBA team in 30 years to advance to the Finals four seasons in a row, and they posted the second-longest winning streak in league history with 27 consecutive victories in 2013. But the Heat were worn down emotionally by four years of deep playoff runs and unprecedented scrutiny along the way. Wade, James, Bosh and several veteran role players repeatedly spoke last season about how much of a grind their run had become and how little joy there was as time passed. Eventually, Wade said, most within the locker room understood it was time for a change. "[It was] very unique; it will never be seen like that again," Wade said of a Heat run that burned out faster than some anticipated. "I think too, man, if it goes on too long, you don't appreciate it. You know, it's like players staying around for 12 years. [Or] it's like players that go to college. If they stay one year, they [become] a high draft pick. If they stay four years, you nitpick at everything." Whereas Riley expressed frustration amid the breakup because the Heat never became "a generational team" that contended together for a decade, Wade said it was obvious the Big Three had run its course. 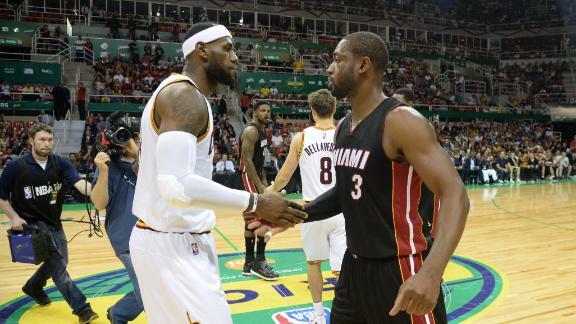 "If we play together eight years, it ain't too special to everybody," Wade said. "If you only go to the Finals four in eight years, it's not that special. But you go four in four, they're going to do a documentary one day [about you]." James and Wade repeatedly watched a documentary about the Detroit Pistons' Bad Boys era last season, which brought the Heat closer to embracing their NBA mortality as a historic core. Both Wade and James privately compared signs of the Pistons' eventual demise to the psychological and physical wear and tear the Heat endured. Wade missed 28 games due to injury last season and struggled mightily in a lopsided series loss to the Spurs in the Finals. James battled through nagging injuries and grew weary of carrying the additional load last season. James had been privately contemplating a return to Cleveland as early as his second season in Miami, but the loss to San Antonio created the first real opening for a departure. James opted out of his contract immediately after the 2013-14 season and began to plot his return to Cleveland. Wade and Bosh also opted out of their deals in what was thought to be a move to give Riley more flexibility to rebuild a younger and more productive supporting cast. Behind the scenes, Wade had always sensed that James was strongly leaning toward leaving the Heat. Seeing the signs was much easier than accepting them. Wade suggested that he began to realize James wasn't coming back to Miami after James and his agent met with Riley in Las Vegas and didn't commit. A day later, Wade and James were headed to Miami. "When it came to the decision that had to be made, I kind of knew a little bit. I could feel it," Wade said. "I knew it was tough on him. It was probably harder because I was around, because it was a tough time to make that decision for him. And one of the toughest parts was because of me and the relationship we had and stuff like that." The only conversation Wade and James had about free agency at that point was quick and succinct. "It was as simple as saying, 'Do what's best for LeBron James, because everybody is going to benefit from you,'" Wade said of what he relayed to James on the flight from Las Vegas. "'You stay in Miami, we benefit from you. Wherever you go, do what's best for you, because wherever you play, somebody is going to benefit off of you. So you have to be happy with your situation.'" Wade, who ended up taking a two-year deal from Miami worth roughly $11 million less over those two years than the one he opted out of in June, insists he holds no grudge. Just as it did in 2010, when James left the Cavaliers to join the Heat, his relocation shifted the conference's power structure. Although the Cavaliers (16-10) struggled initially, they have gradually recovered and are widely expected to be among the teams competing for a championship. Meanwhile, the combination of James' departure and a slew of injuries contributed to the Heat (13-15) getting off to their worst start in seven seasons. "It obviously doesn't look it right now, like it was the best thing for this organization," Wade said of the Heat's tumultuous start. "But you know, I think at the end of the day change is going to be good for everyone. It's just, right now, [the Cavaliers] are benefiting a lot more than we are." Distance hasn't distorted their connection. The two caught up in person at least twice since last summer, with James flying to South Florida to attend Wade's wedding in September and also when the Heat and Cavaliers played an October exhibition game in Brazil. James and Wade realize most will see them only in their basketball roles and currently as ex-teammates. "It's a relationship that basketball will never be able to take away from us, just because we go different ways or I decide to come back home," James said. "So I talk to him regularly. ... You pick up a lot of friendships in this league, but you truly know the real ones when you have to make a decision. And it's huge that I've got him in my corner, for sure." James sees Wade as a confidant who was there at the lowest point of his career, when they retreated to the Caribbean after James' meltdown in the 2011 Finals loss to Dallas. And Wade sees James as the uncle figure for Zaire, who frequently received surprise calls from James to lift his spirits during his parents' messy divorce five years ago. Those moments built a bond that basketball business may never break. So what happens in two years, when both of their contracts are set to expire if they bypass options to become free agents again next season? What happens if James this time makes the recruiting call to Wade in 2016 the way Wade helped to close the deal in Miami in 2010? Would Wade, if he has anything left in the tank approaching 35, feel he might owe James a season in Cleveland if it would potentially help the Cavaliers get over the championship hump? Wade responded with six seconds of uproarious laughter as he rocked back and forth in his seat. "That's funny. That. Is. Funny," Wade said. "I don't even have an answer for that. We're going to leave it at that."